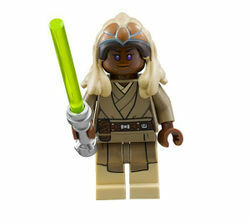 Stass Allie is a Star Wars minifigure released in 2013. Stass Allie has tan robes with a brown belt, as well as black for indicating folds in the robes. Allie has a brown head with violet eyes and a serious expression, and a cream colored Tholothian headdress, which has brown at the front and white at the back. She has tan arms and brown hands. Stass Allie's legs are tan continuing her torso design, and she is armed with a green-bladed ligthsaber. Stass Allie was a Tholothian Jedi Master and served as a Jedi General during the Clone Wars. Along with training in diplomacy which led her to being an advisor to many high ranking officials in the Senate, Stass Allie was an accomplished healer, and she was inducted into the Circle of Jedi Healers. After the death of her cousin Adi Gallia, she was made a member of the Jedi High Council. Towards the end of the Clone Wars, Allie was assigned to lead clean-up operations on Saleucami with the 91st Reconnaissance Corps. During this assignment, Order 66 was issued by Chancellor Palpatine (secretly the Sith Lord Darth Sidious), marking the Jedi as traitors and ordering all Clone Troopers to kill any Jedi on sight. Allie, leading a BARC speeder patrol, was killed by the clones in her group after they opened fire on her speeder, causing it to explode. This page was last edited on 12 January 2016, at 23:56.